I often mine movies for tips on dressing well and bon-mots to drop into cocktail conversation. 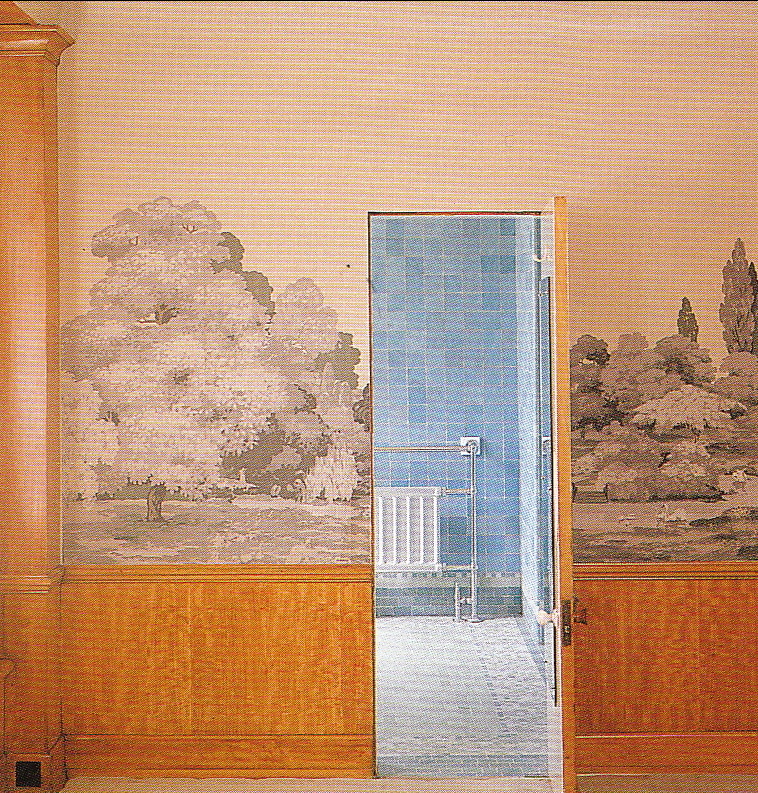 But An Aesthete’s Lament has just reminded me that they are a good source of design inspiration as well. Well, the worldly Mrs. E. and I have been lucky enough to step foot on some real life “sets” — at least they looked movie-perfect. I thought it might make a good subject for a post or two. Have you ever approached a place or stepped through a front door and felt utterly at home? 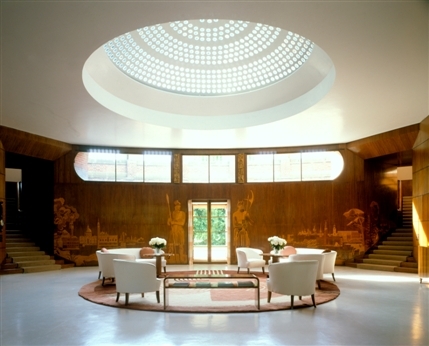 Eltham Palace has been used in two movies: “The Gathering Storm” (Albert Finney as Winston Churchill!) and “Bright Young Things” directed by Stephen Fry. 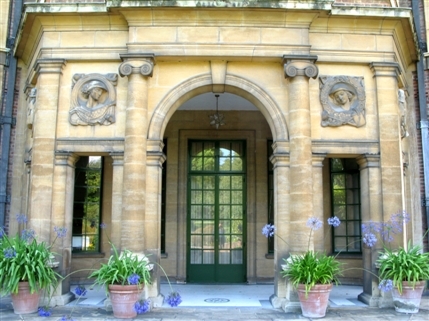 Several episodes of “Poirot” starring David Suchet have also been filmed there. Mr. Suchet has just recorded the audio tour for the property. Interestingly enough, one of Eltham’s owners was, in addition to being a “textile magnate,” a director for England’s Ealing Film Studios. Which may account for its theatricality. 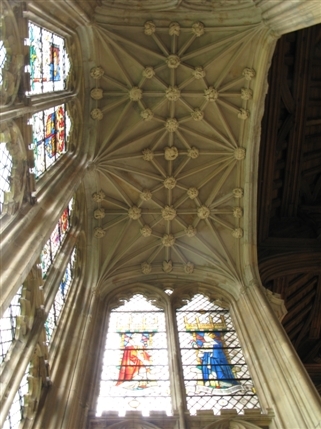 Entrance to the Great Hall is gained by stepping through an 18th Century Chinese screen and suddenly you find yourself in medieval England, where the banners of the Tudors hang from on high and the stained glass windows depict Edward IV’s coat of arms. The Great Hall was restored (having survived a Nazi bombing), but it doesn’t feel at all “new.” It’s very easy to imagine yourself part of a hunt feast, here, surrounded by wooden beams and a choir loft. The palace eventually fell out of favour with the royals and a civil war didn’t help matters much. In the 1800’s Eltham was a picturesque ruin, painted by the likes of JMW Turner. Then along came the new money … and a lemur. 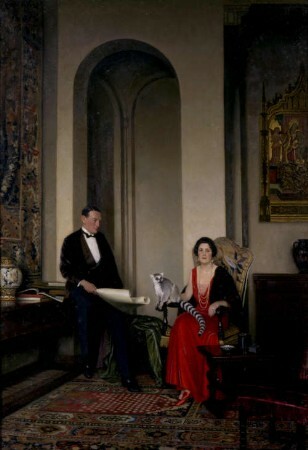 The Courtauld’s were granted a lease for Eltham in the 1930’s and engaged architects Seeley and Paget to marry a new wing to the Great Hall. The result was, for the time, ultramodern. The new entrance hall (seen here again with your faithful correspondent perspiring profusely therein) was created by Swedish designer Rolf Engströmer. The inlaid wood walls show a Viking and a Roman soldier as well as buildings that the Courtaulds admired. 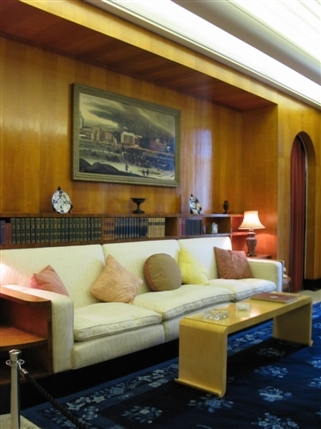 Inside, Art Deco reigned supreme, with an ocean liner style dressing room for Mrs. Courtauld, an aluminium ceilinged and birdseye maple paneled dining room. The library with a sofa designed with an eye for convenience… built in shelves and a place to put your drink. Mod cons, indeed. As far as home offices go, there might be something to be said for the world map, paneling… oh, and an entire room dedicated to housing your desk. An interesting note, Stephen Courtauld didn’t like the telephone. In his office there is a wall mounted one inside a little cubby hole. It could only be used for internal calls. My kind of man. 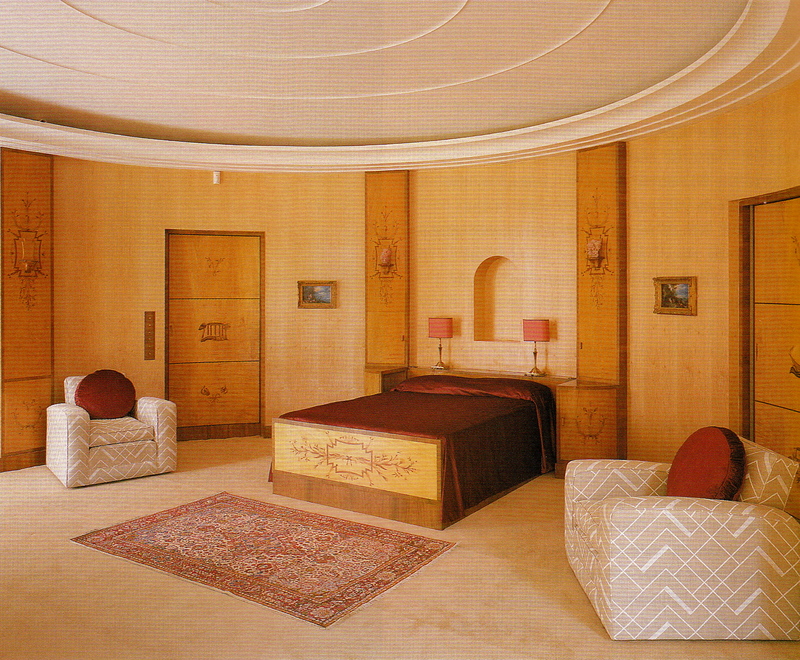 His bedroom was also nicely paneled in bird’seye maple (I think), and featured hand-painted wall treatments. There was even “hidden” door that led into his bath. Her boudoir, bed and bath were very liveable. 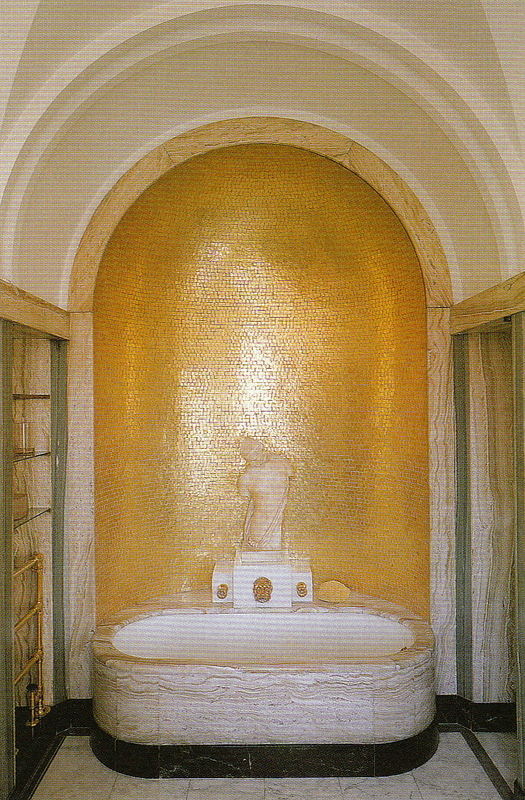 I love the lighting that is hidden under the tray ceiling, and half-Greek that I am, I find it hard to resist gold tiling and a bust or two hanging around the joint. There is much that we loved about Eltham. Although, situated as it is eleven miles from London, it would be a bit too far out for us. We did take away a lot of good interior decorating ideas. Really the only thing that we are lacking, here at the Easy and Elegant manse, is a spectacular pile of money to have it done correctly. But that’s the thing about movie sets, real or not, they continue to inspire. 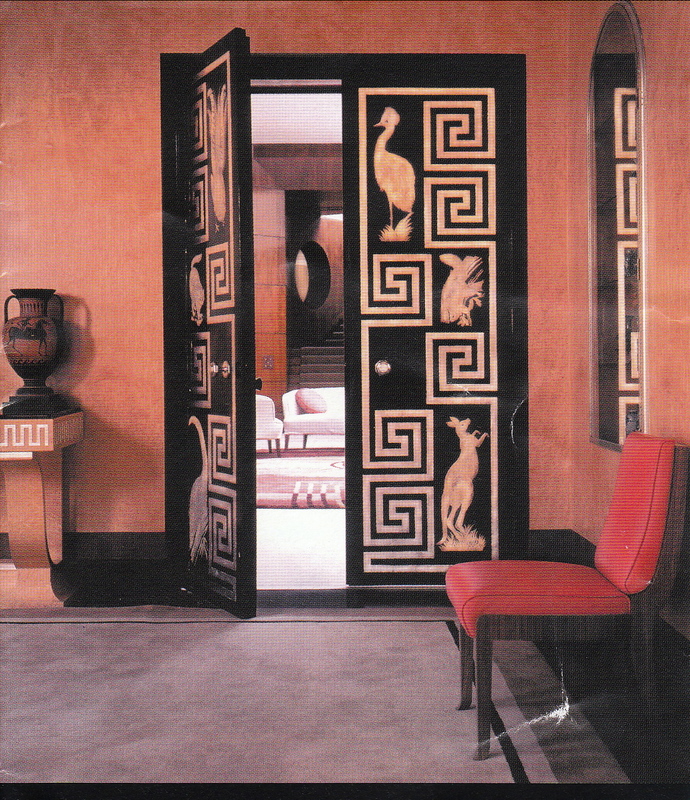 This entry was posted in Elegantology and tagged art deco, Elegantology, Eltham Palace, England, Stephen and Virginia Courtauld, travel. Bookmark the permalink. It’s a spectacular house and it’s very often used for filming and photography. I’ve seen plenty of films and magazine features and advertisements that were shot there. The entrance hall is the most recognizable feature. It’s strange visiting the house today because it’s in a pretty dodgy area. I suppose it would have been open countryside in the past, but it’s now a decidedly unattractive suburb. Sir Flutter, and uphill both ways from the train station, if I recall. But worth it. Thank you, thank you, thank you for the tour of Eltham. It is the most glamorous place one can imagine. 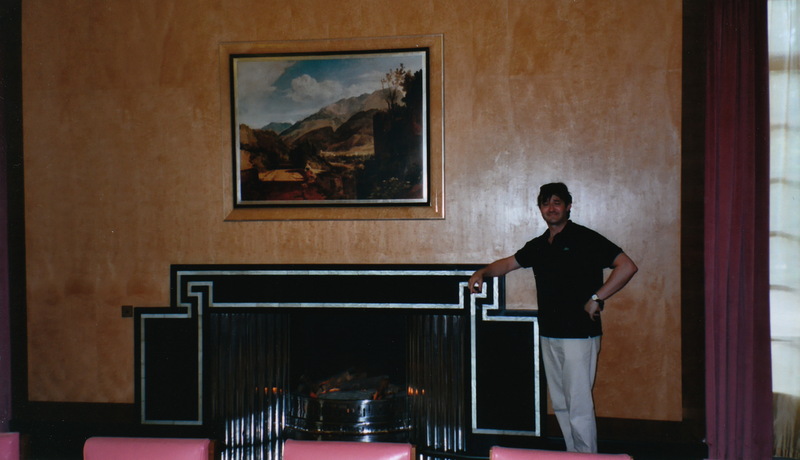 The World of Interiors did a wonderful story on it a few years ago, when it was refurbished with new reproductions of furniture that had been lost over the years and copied from period photographs. AL, a pleasure and a daunting task stepping into your territory, It is exhausting. I could have written a book. I don’t know how you all do it on a regular basis. The furniture is reproduction, but very nicely done. Eltham was the first large scale deco place we’d visited (before Radio City Music Hall!) and we were gob-smacked. Mr. Lane, thank you. Once I recover I will post about a favourite place in Paris. It may be some time, though. ‘Til then I think I shall retire to the sofa with a restorative brandy and my dressing gown. Or maybe go for a run. Happy weekend.